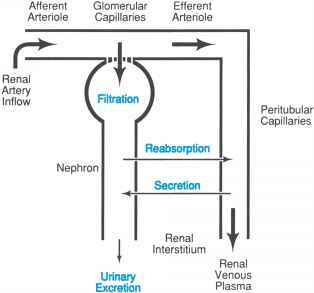 Acidification of the urine also occurs in the connecting tubule and collecting duct. The residual amounts of bicarbonate are reabsorbed, and the pH of the final urine is lowered so that substantial amounts of titrated buffers can be excreted. Protons (H+) are actively secreted by intercalated cells that appear among the principal cells from the midregion of the distal convoluted tubule into the medullary collecting duct, although they are absent in the inner medullary collecting duct. The regulation of proton secretion in the distal nephron is an important determinant of acid-base balance, as is discussed in Chapter 31. Figure 8 shows the luminal surfaces of intercalated cells surrounded by principal cells in the cortical collecting duct.